I had the pleasure of giving brief remarks at the formal ribbon cutting of the 35 megawatt Avalon Solar facility near Sahuarita on Friday [photo credit, TEP]. The plant will reach 56 MW later this year, making it the largest solar resource in Tucson Electric Power's territory. The site is on 500 acres of Asarco disturbed lands but not lands used directly in mining. The Avalon solar project grew out of an EPA effort to develop renewable energy on lands already disturbed, including mined lands. This could be the first on many such facilities. Asarco officials expect that the Mission mine tailings piles will be ideal sites for new solar farms when those areas are closed. I’m honored to be included in the ceremonies here today to launch the Avalon Solar facility. It is so exciting to see this marriage of mining and solar energy. Renewable energy requires infrastructures built with metals and minerals. We need sand and gravel, aggregate, limestone for cement, steel for the frame, silicon for the solar panels, and copper – lots of copper – for the motors, generators, transformers, and transmission lines, to turn the suns energy into electricity and move it where we need it. Arizona was the #1 mining state in the US last year, with primary production exceeding $8 billion, coming from copper, molybdenum, sand and gravel, aggregate, and cement; all minerals needed to build solar power facilities. Apple Computer is building a $2 billion data center in Mesa that will be powered, like all of its data centers, entirely by renewable energy, and in the Arizona plant, entirely with solar energy. Our modern society demand for base metals is increasing by 5% annually for use in cell phones, hybrid vehicles, and other technologies, including building solar and wind energy arrays such as built here. Wise use of our natural resources – our mineral resources – is the crux of building an environmentally sustainable society. The marriage of mining and renewable energy is also symbolic as well as practical and environmentally beneficial. There is a growing realization of the benefits of mining and generating our power locally. In 2007 the word of the year was “locavore.” A locavore is a person interested in eating food that is locally produced, not moved long distances to market. The locavore movement in the United States and elsewhere was spawned as interest in sustainability and eco-consciousness has become more prevalent. We are seeing a movement now to promote [and let me quote] “more metal production near centers of demand, similar to the locavore movement. Green technologies should incorporate domestic mining, which reduces the financial and environmental costs of transporting metals from far flung sources and decreases the carbon footprint, while providing jobs and wealth to the local community.”* The same holds true for energy production. The Avalon Solar project is a prototype of what mining can contribute to sustainable energy, sustainable economy, and sustainable environment. You here today are who I call the new environmentalists – you are leading the fight for a more sustainable world by efficiently providing the resources for our technological society, and by doing so, reducing global environmental impacts, and transitioning us to a renewable energy society. A sustainable environment demands that we mine and produce our energy locally. Thank you for what you do for Arizona, the nation, for the economy, and for the environment. *Reference: Olivier Vidal, Bruno Goffé and Nicholas Arndt, "Metals for a low-carbon society," Nature Geoscience, v6, November 2013, pp. 894-896. The Fraser Institute’s 2014 survey ranking jurisdictions worldwide for their favorability for mining has just been released. Arizona is ranked 18th in the world in investment attractiveness, moving up 4 places from last year (and 6th in the US). We are down 4 places in Policy Perception (mostly due to federal land management is our understanding). We jumped dramatically from 25th to 12th in Best Practices Mineral Potential. We are ranked 20th in Current Mineral Potential, behind only Nevada and Wyoming in the US. · Objections to in-situ copper mining at Florence. · 2+ years to receive drilling permit on US BLM mining claim. I am delighted to report that Arizona moved up to the #2 rated US jurisdiction for our Geological Database compared to #6 last year. That’s an area we at AZGS are working on aggressively, digitizing hundreds of thousands of pages of mining records for free online downloading. A second table shows 52% of respondents gave top rating to Arizona's Quality of Geological Database (includes quality and scale of maps, ease of access to information, etc), exceeded in the US only by Wyoming at 54%. 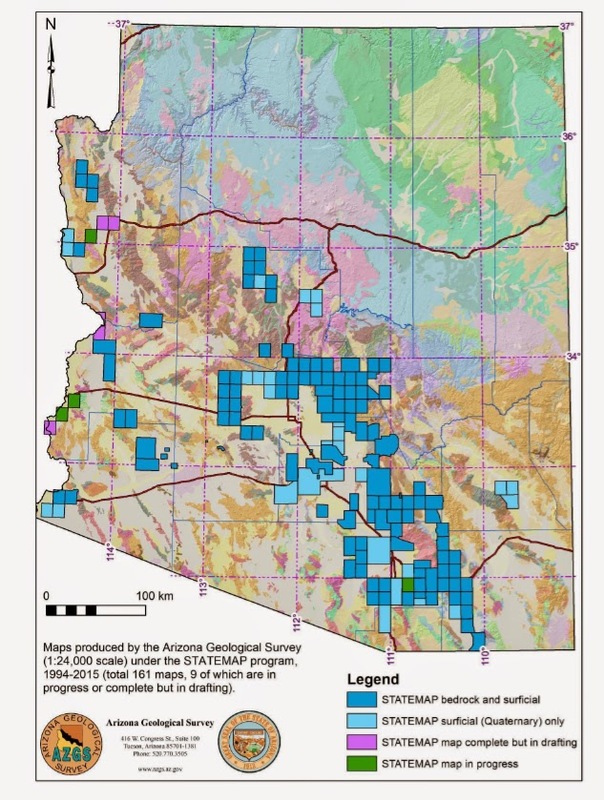 No respondents identified Arizona's geological data as a significant deterrent to investment. The USGS has issued a new geologic map of basement terrains for the conterminous US and Alaska, intended to help national mineral resource assessments. Three different domains intersect in Arizona - Mazatzal, Great Plains, and Mojave. The report is available online for downloading. The basement-domain map is a compilation of basement domains in the conterminous United States and Alaska designed to be used at 1:5,000,000-scale, particularly as a base layer for national-scale mineral resource assessments. Seventy-seven basement domains are represented as eighty-three polygons on the map. The domains are based on interpretations of basement composition, origin, and architecture and developed from a variety of sources. Analysis of previously published basement, lithotectonic, and terrane maps as well as models of planetary development were used to formulate the concept of basement and the methodology of defining domains that spanned the ages of Archean to present but formed through different processes. 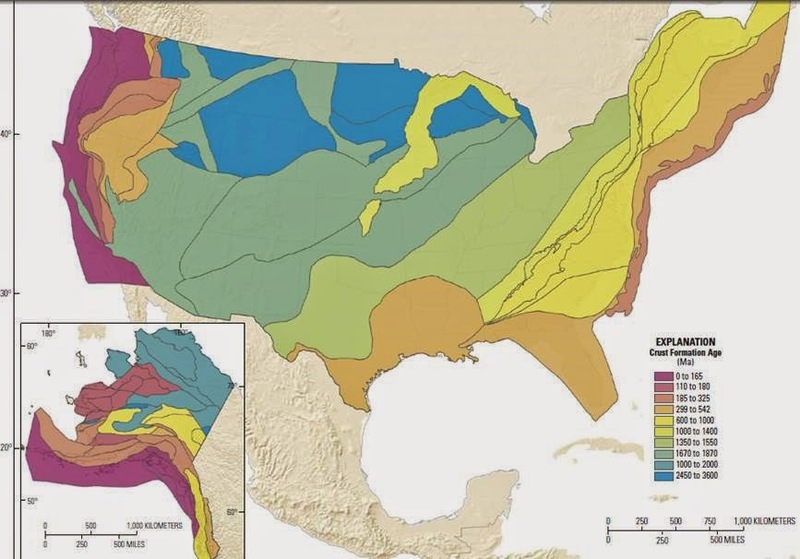 The preliminary compilations for the study areas utilized these maps, national-scale gravity and aeromagnetic data, published and limited new age and isotopic data, limited new field investigations, and conventional geologic maps. Citation of the relevant source data for compilations and the source and types of original interpretation, as derived from different types of data, are provided in supporting descriptive text and tables. The tectonic settings for crustal types represented in the basement domains are subdivided into constituent geologic environments and the types of primary metals endowments and deposits in them are documented. The compositions, architecture, and original metals endowments are potentially important to assessments of primary mineral deposits and to the residence and recycling of metals in the crust of the United States portion of the North American continent. The databases can be configured to demonstrate the construction of the United States through time, to identify specific types of crust, or to identify domains potentially containing metal endowments of specific genetic types or endowed with specific metals. The databases can also be configured to illustrate other purposes chosen by users. Reference: Lund, Karen, Box, S.E., Holm-Denoma, C.S., San Juan, C.A., Blakely, R.J., Saltus, R.W., Anderson, E.D., and DeWitt, E.H., 2015, Basement domain map of the conterminous United States and Alaska: U.S. Geological Survey Data Series 898, 41 p., http://dx.doi.org/10.3133/ds898. This week marked 4,000 posts on this blog since it was launched on January 1, 2007. We've seen over 1.7 million page views since we started tracking that in mid-2009, but a surprisingly small 2,090 published comments. What's been heartening is the impact this blog has had as a communication tool for the our geoscience community and beyond, including a number of news reporters who monitor it for story ideas. The past three years has seen a drop in my blogging for a couple of reasons. The biggest is lack of time. As the Arizona Geological Survey transitioned from being mostly state-funded to now 90% soft money funded, I spend much more of my time writing grant proposals and managing the awards we receive. In particular, our data integration and management capabilities have made us a national and increasingly an international leader in this booming field. I am traveling a significant part of the time as our data network becomes global in scope. The funds from these projects help underwrite the Arizona projects and duties that the State has not been able to fund since the Great Recession began. The other big change is the rapid growth of out social media presence, particularly with Facebook and Twitter. Mike Conway, Chief of the AZGS Geologic Extension Service, has put AZGS in the top 1-2% of Twitter sites in numbers of followers. Our Facebook regularly outdraws our main website in numbers of visitors. A lot of things that I used to blog about, albeit briefly, are now better presented on these other social media outlets. In some ways, the blog is becoming so 20th century. Yet it's still a good outlet for more extensive news and ideas, so I expect to continue with it for the foreseeable future. The level of posting will likely stay at the current rate. Fergason with AMEC had reported a new fissure south of an existing mapped fissure trend. This turned out to be a series of small potholes along a very linear arrangement of shrubs. Joe mapped in all the new features before heading across the valley to the Apache Junction Study area. Ken had reported a new fissure near a mapped fissure in the Ironwood and Guadalupe Rd area. One of the largest ironwood trees I have ever seen was growing at one end of the fissure. Both of these fissures are in the general vicinity of the Central Arizona Project but don't extend close enough to be a concern at this time. Joe mapped in several decent-sized fissures parallel to mapped fissures on the southern portion of the Baseline and Meridian fissure complex. This area is still very active, swallows a lot of water from captured drainages, and has deep open cracks at the bottom in many areas. The northern portion across baseline has extended closer to Baseline Rd beneath the fence and younger fissures have opened parallel to existing mapped trends. A lot of this appears to have occurred late last fall with the September rains. One last observation is the deep potholes on the south side of Baseline appear to correspond with a cracked zone of Baseline Rd. The road in this area is otherwise pretty crack-free. Some cracks extend from the road to the dirt adjacent to the road. In January 2002, the University of Arizona’s Dept. 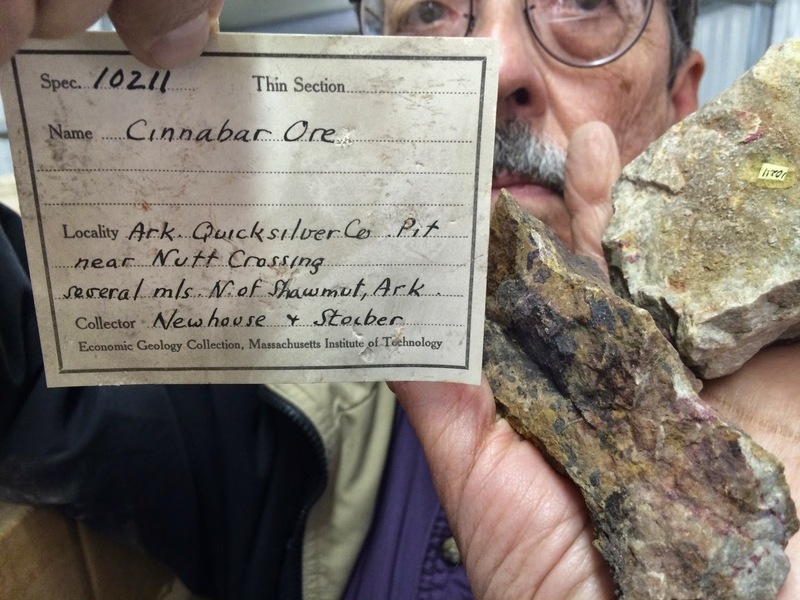 of Geosciences (UA) acquired the Waldemar Lindgren Ore Collection from Harvard University. The Arizona Geological Society (not the Survey) and the Tucson Gem and Mineral Society played a pivotal role by jointly providing ~$25,000 for curating and transport of the collection to Tucson. Assorted paperwork and perfunctory catalog listing the 840 boxes, generally by location. It was originally thought that the collection included Lindgren's premier specimens from seminal investigations at the Morenci mine and others. 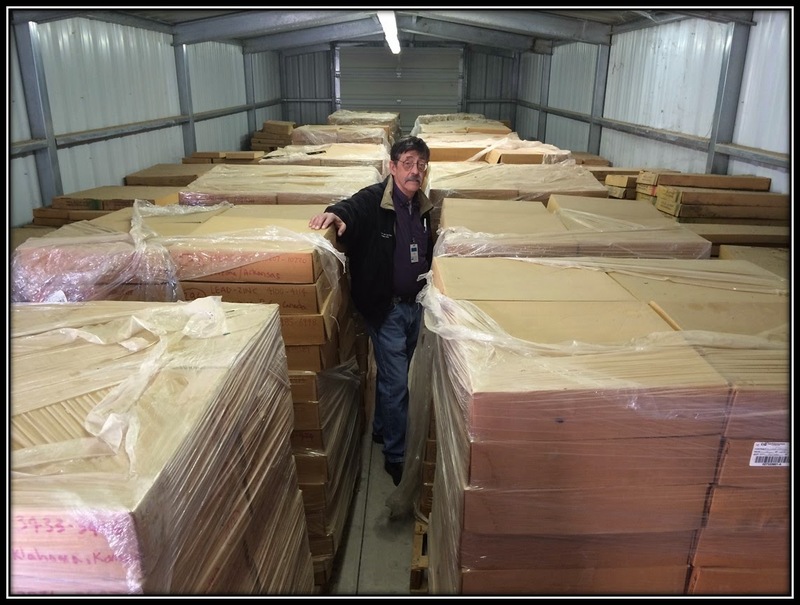 But initial examination of the boxes when they first arrived found mostly surface grab samples and little of significance. UA professors have not used the collection for teaching and research as originally anticipated. So, the question is, should something be done with the collection or just let it sit in storage? The Arizona Geological Society last night established a small committee to consider options and make recommendations. One possibility is to open, inventory, photograph, and inventory every specimen and then evaluate the collection's usefulness. The committee will report back in May.